From the cold and blustery Patagonia in the south to grasslands, snow-covered mountains, waterfalls, and impressive metropolises like Buenos Aires and Cordoba in the north, Argentina offers a plethora of attractions. It is also made up of almost the entire southern half of South America, covering an area of just under three million square kilometers. The people of Argentina are as interesting as the country itself. The population is a mixture of diverse national and ethnic groups, with descendants of Italian and Spanish immigrants most predominant. The economy of Argentina is showing positive signs of growth after years high inflation and devaluation of the currency experienced a decade back. New Hope's projects in Argentina take place in the city of Cordoba, which lies at the heart of Pampas region. Our projects are all local initiatives and through our volunteers, we aim to give hope to the underprivileged and achieve the goals of our projects quickly. 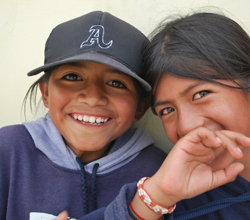 Come and join our Argentina program and visit the wonderful country while helping the needy! In recent years, volunteering has become more of a business than charity. Many organizations in the US, UK, Australia, and New Zealand run volunteering programs solely for profit. Please check Travellers Quest volunteer abroad in Argentina page for different organizations and their fees and you'll know for sure. But this is not the case with New Hope Volunteers. Our aim is to offer World’s Most Affordable volunteer program (without compromising the quality) so that all volunteers, irrespective of their income level, can volunteer to serve humanity and enrich their life. We hope to make the dreams of college students and budget travelers come true. In our program, except our registration fee of $279,which we need to advertise, cover office expense and pay salary, volunteers pay their money directly to the projects and for your accommodation. This ensures that 100% of your money goes to the project. In addition to our registration fee of $279, here you find the world’s most affordable weekly program fee, which includes room, food (3 times a day), project details and field support. The volunteering in Argentina program fees will cover expenses that will begin on the first day of the program (usually the first or third Monday of the month) to the last day of the program. If you arrive before the first day of the program or you decide you stay beyond your program’s last day, you will be responsible for the additional expenses, which would typically be around $30 a day for room and meals at a hostel. New Hope Volunteers will arrange for the accommodation throughout the program. During the program, volunteers will in a hostel located in a safe and secure neighborhood. The hostel is not far from the center of Cordoba. In the hostel, you will have to share your room with other volunteers, and meals will not be provided to you. You will need to eat out. Restaurants and cafes that serve good and cheap food are found everywhere in Cordoba. During your program, volunteers can also enjoy the landscape and other attractions the city has to offer. You can visit museums, colonial buildings and churches, theaters and parks and squares. During the volunteer program, our country coordinator will be in touch with you every 10-15 days to make sure you’re comfortable and happy. Volunteers will also have access to coordinator’s mobile phone and can call up anytime if any problem arises. When should I apply for the volunteer/internship programs in Argentina? Are there any necessary requirements to participate in the Argentina-based volunteer programs? Who manages the volunteer projects in Argentina ? When are the Argentina-based projects available? What is weather like in Argentina?